I find this weird, awkward and I am even short of adjectives to describe this as I see ‘Kumawood’ as an industry that should be producing movies based on our cultural values. But what do we see? they seem to have lost it as they are seen constantly copying stories either from Indian movies or Nigerian old movies. And I must admit I like or watch the kumawood movies just for its comedy. Nevertheless, I still find it very difficult why movies done in the local language thrive on mediocrity. They seem not ready to do anything meaningful and right as far as movie making is concerned. Sometimes I watch some movies produced in the local language and I ask myself if the makers of those movies really have thinking minds?. I doubt this because, there are some common mistakes that should not be made, yet are seen in these movies. After so many years of criticizing these movie makers, most of them still write subtitles as if they are speaking Twi. 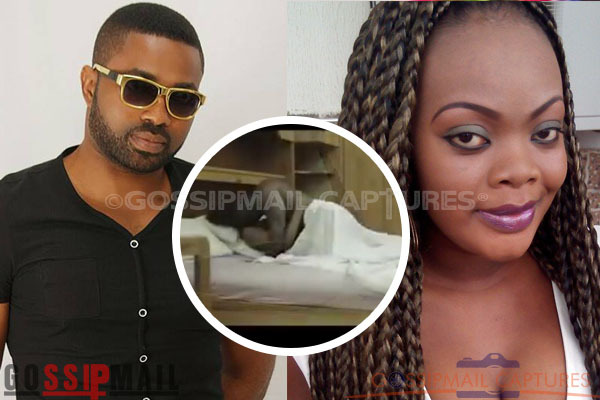 And in the movie which Ghpage.com is going to show you at the latter part of this article portrays a pastor and his wife who were being blackmailed by the wife’s old friend she accommodated in her house. And there is a s3x scene in the movie which somewhat looks real, and also looks like the copycat of what we saw Majid Michel do Ella Mensah in the Perfect Picture if my memory serves me right. Everything looks visibly nakked,with the back of the man shown in the clear view of the camera. According to what Ghpage.com saw, Samuel Ofori known and Bernice Asare were the lead characters. Share your view in the comment section below, what do you think about this? …Have a say !